I am an apostate. I've always wanted to say that but, of course, there are only certain situations in which you can say this. How did this come about? Well.... way back in the late 80s and early 90s when hair was big and ties were small I was a keen postgrad student at University of Otago. I was into evolutionary biology and the most exciting game in town at the time was biogeography (hey it still is!). Biogeography is the science of explaining the distribution of species - why a species is found in one place and not another. Species can either move themselves around through dispersal or they can be moved around by earth processes like continental drift or have their range split by things like mountain uplift - what is generally called vicariance. At the time vicariance was in the ascendency and dispersal was a dirty word to use. Hitting the top of the ecology and evolution charts at the time was a concept which we might think of as ultra-vicariance. Panbiogeography was the idea of Leon Croizat, a European biogeographer who had lived much of his life in the New World. He wrote some enormous books in the 1950s and 60s on his idea that life is the uppermost geological layer, and like other layers, the distribution of this layers is basically down to geological processes. Dispersal was seen as something that didn't have any real biogeographical meaning. By drawing lines, called 'tracks', between different populations of a species or close relatives you could reconstruct the history of the former wider distribution of a taxon which had been split apart over time. Quite what these tracks represented was a little hazy but that just added to the mystique. Croizat's ideas had mostly come and gone but a bunch of mainly New Zealand biologists had championed the idea of panbiogeography during the 1980s and it was again popular. It was a great time to be a biogeography student. There was a whiff of revolution in the air and many of the main players would pass through University of Otago. 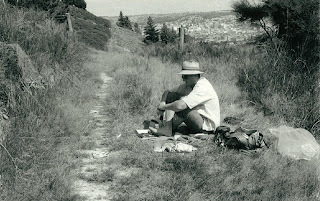 Mike Heads lived in Dunedin at the time (and continues to be a major proponent of panbiogeography), my supervisor Russell Gray published in the area, Robin Craw, a leading disciple also lived locally, and Rod Page, who examined my PhD thesis, would visit from time to time. At the time a special issue of the New Zealand Journal of Zoology was published on panbiogeography which showcased this new method. So I was well-trained in this field, exposed to all the main players and could explain the methodology and philosophy of panbiogeography when I found myself at conferences in the States. I could tell my tracks from my main massings, my ocean baselines from my minimum spanning tree. I was a panbiogeography cheerleader! So what happened? For me DNA happened. As our understanding of what DNA can tell us increased we were better able to understand the timing of evolutionary events. In study after study that my postgrads and I did, in moths, spiders, penguins, beetles, bats and mites we found that species distributions were just too young to have been derived from geological processes. This meant that dispersal was a dominant factor. This was also found in most New Zealand studies in most other labs. So a panbiogeographical explanation just didn't seem to fit with the timing of the patterns that we observed in taxa; lineages in New Zealand are just too young to have been here since the Gondwanan breakup and must have successfully dispersed here on their own. This idea of the importance of dispersal has been a constant theme on this blog, e.g. here, here, here, here, here, and here. And there panbiogeography languished for a time. For the last decade or so I have found my research turning more and more to looking at measuring the impact of dispersal on biogeography. However, their has also been a recent resurgence in panbiogeography papers that seem to have as a central theme the fact that we should not trust molecular studies in general and the molecular clock in particular. The continued promulgation of an idea that seems to ignore the last 30 years of progress in evolutionary theory, molecular biology, computational biology and geology seems staggering. Jon Waters (University of Otago), Steve Trewick (Massey University) and I decided that enough was enough and that we needed to question how such an outmoded idea was still getting published in quite respectable journals. We recruited a few colleagues to help and have now published a Point of View in Systematic Biology. We focussed on one of the main tools of panbiogeography, the track. The track connects different parts of a taxon's distribution and has been defined as giving 'shape to or expression to the space and time that necessarily intervenes between disjunct localities' which does not actually tell you how and where to put your lines on a map (which seems to be arbitrary to a particular scenario). Often the tracks are in disagreement to phylogenetic reconstructions for a group and it is not clear then what a track is showing. Finally, as new data is collected, especially fossils outside the current known distribution, track networks will radically change. We conclude that given the lack of utility of panbiogeography, its lack of hard methodology, its lack of quantitativeness and the amount of evidence against the interpretations that it generates, that the only reason that panbiogeographers continue to publish is through some kind of feeling of being fair on the part of editors. However, science is not about giving 'equal time' to all hypotheses otherwise I would have to teach a lot more creation science. If hypothese are repeatedly shown to fail or lack usefulness then they should be put to one side until someone works out how to make the idea useful and successful. We feel that panbiogeography is in this situation and it is currently distracting a number of researchers from using methods that explain the world better. PS I recently gave a talk on this at the 2013 Evolution conference in Utah. One of the downsides of your children moving to the teenage phase is that you tend to miss out on the latest movies for kids. Many of these movies that I watched with younger versions of my sons have become personal favourites. Recently, I happened to see what I consider to be the best of the Disney films of the modern era - Mulan. I like the story, I like Eddie Murphy as the dragon, I like the songs and I especially like that Mulan isn't a princess! I came across it on the telly last week and enjoyed catching up with the characters after a few years. One scene that always made me laugh was when the soldiers decide to go skinnydipping while Mulan is bathing (for those of you that haven't had the pleasure, Mulan pretends to be a man so that she can join the Emperor's army to save China as well her father's honour). Particularly amusing is when the soldiers play king of the rock with one of them sitting on a rock in midstream and knocking allcomers back into the water. I recall playing a similar game in my youth. In the game the king has an advantage because the challenger is coming out of the water whereas the king is on solid footing on the rock with gravity on their side. This time while watching the movie the scene also reminded me of a paper that has just been published by my colleagues Rob Cruickshank, Hannah Buckley and me in the journal Trends in Ecology and Evolution. What? All of us are interested in how populations form in new habitats. Rob and I tend to be more interested in the long term evolutionary patterns whereas Hannah is more interested in the ecological processes. Over the last few years we have learned how to speak to each other so that the evolutionary biologists can understand the ecologists and vice versa. There are several areas in which this seems to help. One of the puzzles of looking at populations that have established in new habitats, such as islands, recently glaciated terrain, volcanic areas and so on, is that, despite a constant 'rain' of colonisers carrying different genes, most populations have a reduced genetic diversity. There are several ideas as to why this is the case. Recently, Jon Waters from University of Otago and his colleagues speculated that the 'founder (first established population) takes all'. There may be several explanations for why this happens but Jon and his team favoured what is termed 'space pre-emption'. In other words the first established population is king of the rock and newly arriving individuals with different genetic haplotypes will find it physically difficult to find the space they need to survive and establish and then to push the king off his rock. So the order of arrival of different populations is crucially important, a population arriving second to an island A will struggle to establish whereas it will find it easy if it is first to island B. We followed on from Jon's paper by suggesting other reasons by which this phenomenon could play out. First, certain populations may have a competitive advantage (a useful behaviour or physical trait) that allows that group to be successful. An individual is more likely to become king of the rock if they are strong, large or agile. Second, niche specialisation to the particular area could help the established population. The more that you have played king of the rock in one area, the more you learn about best places to stand to anchor yourself to the rock. Third, incoming populations may be genetically incompatible with the established population which will affect their chance of mating. Those that turn up at the swimming hole just to relax will not end up as the king of the rock. Fourth, there may not have been enough time for new populations to have arrived on the island. You may be king of the rock simply because there are no or few challengers. There are no doubt other possibilities to explain this phenomenon and the most important thing is that all of these factors could be at work. What is most important about this debate is that we are dealing with a biological process that falls a little between two major types of study. Ecological studies tend to be interested in what is happening over a few generations. Evolutionary studies tend to be interested in what is happening over thousands of generations. As such, historically ecologists and evolutionary biologists have not worked together that closely and even have different languages for similar concepts. Processes like species establishing on islands take place somewhere between these ranges in the tens to hundreds of generations. As most founding events take place over the intermediate range of generations our understanding has often been slowed by misunderstandings between the different types of research. The upside of the Waters paper and our response is that scientists from ecology and evolution backgrounds are finding ways to communicate and understand one another. Now that I think about it, that's one of the messages of Mulan as well.